I believe I have pretty much any non-electrical tool and/or repair item I'd need for pretty much anything that might come up. Just In Case. It's not like I have a lot of repairs to do, but you just never know. The top tier has mostly fasteners and TV stuff. Little things that need to be in their own section to keep them together. This has larger, longer tools that are flat enough to fit. This tier has the rest. I do have an electric drill, which can be plugged in for a while, and then used with just the charge, but it's the only tool that plugs in. My tool box weighs 33.5 pounds, but sure feels heavier! Jealous, guys? ; ) Well, don't be. When I start loading my motor home, which will probably be a small class C, you can imagine how much weight I'll be able to load in it. This tool box may come along, but probably not most of the contents. I can hardly lift it, and I probably won't need most of the things in it. I might need to have an RV owner-person go through it with me to see what to bring and what to leave out. I have a couple of little gadgets on my blog that tell me some stats on what's happening with traffic to the blog. They are fun to check to see how I'm doing as far as traffic being up or down on a day-to-say basis. The part I found most interesting was how many visitors I've had from different countries. There is a place to set whether or not you want translations, and I now have mine turned to "yes," I don't know if my foreign visitors read English, but if not, hopefully they will still be able to follow along. It looks like one or two visitors aren't going to show on the map, but at least they are detailed in the numbers below it. If you have Blogger and haven't noticed this "Stats" tab, click on it and see what your blog has been up to. I love gadgets, and always click on the ones I find in other people's blogs. That's how I got all the little things on my Blog. I don't want it to be messy or too commercial, but I have to admit those things make this more fun for me. I like checking on how many people have clicked on ads, and on different pages. And just for your information (in case you didn't know), when readers click on the ads, I make money. It isn't much, and it takes a lot of clicks, but I figure over time I'll eventually get a check for something. If you go into your Blogger "Monetize" tab, it explains it all and you can do the same thing. I chose the option that puts up ads relating to what I'm writing about that day, so the ads change. Sometimes they are about crafts, sometimes pet products, depending on the subject of the post. I can't click on my own ads, so if I want something, say from Amazon, I go to someone else's blog and click on their ad and purchase through them. Then they get a small payment for my purchase. Like I said, it's not much, sometimes nothing in a day, sometimes only pennies. But it is fun to follow and see how it grows over time. I also have an icon on the right for a website called Site Meter, which is free. You can upgrade it and pay for the upgrade, but the free part has everything I want, including a world map that shows where your visitors are located. 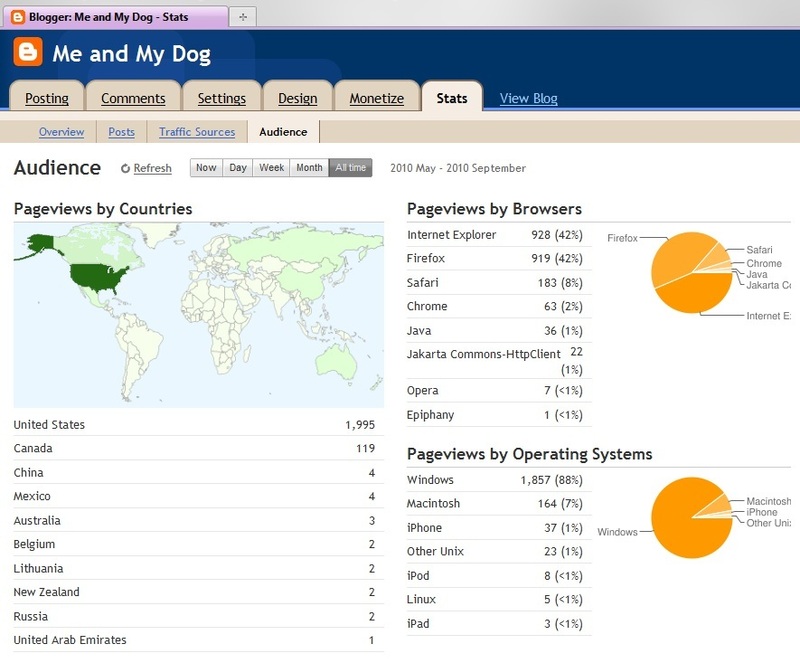 Now that I've found the stats here in Blogger, I don't know if I'll keep Site Meter. Then I have a gadget at the bottom of the blog on the left side. This one has the weather, although it doesn't have my exact location, it's around a 15 minute drive from my house. (Here in San Diego, I don't say 15 miles, it's 15 minutes, depending on traffic of course.) The reason I picked this one is because it was pretty, and if you click on it you can see the vegetation moving in the breeze, if there is one, and also it changes from day to night, and you can see the sun and moon moving along. NOTE: I figured out that I could get my city (San Marcos) for this gadget, and have corrected it. And there are others, as you can see by moving around in the blog. I hope they don't become too distracting, but as I find new ones, I'll add them and try them out. I'm not a computer geek (wish I was! ), but these simple gadgets are easy to set up and enjoy, or visit from time to time to see what Me and My Dog is doing. I have actually learned a lot about how the web works since I've started my Blog. SDG&E actually did turn off my air conditioning in the afternoon. I realized it was getting warmer and muggier, even though the A/C was cranking away, and then I realized it wasn't putting out any more cold air. On the 5:00 news they had a story about the heat, and said we set an "all-time power usage record" in San Diego and Monday was the hottest day of the year in San Diego County (actually it was an all time record breaker for the whole area including Los Angeles). I'm lucky I was off, I was able to stay inside with my A/C until it was shut off (only for a few hours). It's a portable swamp cooler. I just roll it wherever I want it, add lots of ice and water, plug it in and turn it on. The one I have now has lots of different settings, and a remote control, so I don't even have to get up to use it. It has a timer in case I want to use it for specific period of time then have it turn itself off. This isn't the exact one I have, but very similar. Boy, do they make a difference! When I was in Pollock Pines, we had a very hot summer and I didn't have air conditioning in my house. I was working at Chile Bar Slate Mine at the time. I worked in the office for the General Manager, but I was still considered a miner, had to wear jeans and steel toed boots, and had a full face respirator that I used occasionally when the slate dust wasn't under control. I'll tell you, I'd get home from work, turn on the swamp cooler, throw all my clothes in the washer, jump in the shower, and when I'd finally sit down in the living room (which was upstairs in that house) it was already cooling down. I'd sit right in front of this little baby, and it was heaven. I don't use it much here in San Diego, but I've brought it out a few times this summer. Sure was glad I had it yesterday. WELCOME to my new follower, Gypsy Jane! I am a gypsy at heart, myself, and appreciate you following along with us. Welcome aboard! WOW, on the TV news they just said it's 105 degrees at my office in San Diego right now at 11:00 a.m. That's HOT, especially for San Diego. I'm home today because I worked on Friday, and it's 98 at my house and climbing. Today I slept in until around 9:30 and it was hot already, sun streaming into my living room, so I closed everything up and turned on the A/C (probably only the third or fourth time this year I've used A/C). Catch it early and I'm usually good for the day in weather like this. Plus, I'm on a special SDG&E (San Diego Gas & Electric) program where I allow them to shut off my A/C periodically at peak usage times during summer months and I get a credit of $100 in December. That paid for my December and most of my January bill last year. Since I don't usually turn my A/C on, unless it's super hot, that's a total win for me. 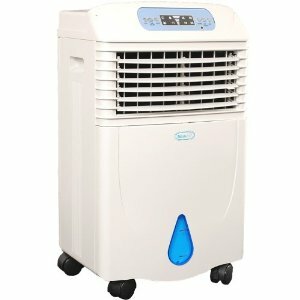 I have a feeling they might shut me down for a while this afternoon, so I'm cooling things down now. I must be getting old. When I get home from a trip, after all the driving, visiting, playing with grandkids, etc., it takes me weeks to get back to normal. I've been so tired since I got back-and a little under the weather, but I've also not been able to sleep, which is unusual for me. Today I'm finally back to normal. Saturday I slept in late, did virtually nothing all day, then dressed and took Katie out to grocery shop in the early evening, had the car washed, and stopped at the pet store to get food and treats for Katie. 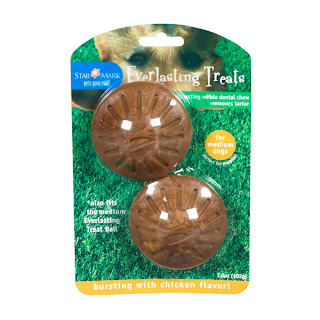 I got her a cool new toy, a ball with both sides cut out, and you put a treat into the cutout, and the dog has to work at it to get it eaten. She loves it! It was kind of expensive, but it has kept her busy now for two days, and she hasn't finished it yet. I bought a refill, too, which I'll give her in a couple of days. Double sided Everlasting Treat Ball. 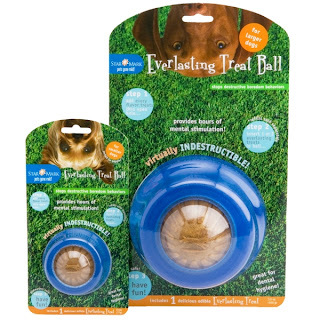 The ball comes with one "edible" insert, so you have to buy a spare Everlasting Treats, and use one of them. 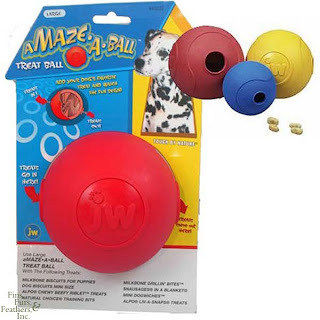 It's just a simple ball with a hole in it - you put in treats and the dog noses it around and the treats fall out as it rolls. It takes Katie a while to empty it. I don't put "treats" in, I put in another kind of dog food, so although she thinks she's getting a treat, she's actually getting good, nutritious dog food. Sunday I woke up early and realized it was going to be hot. It's was 100 degrees, or close to it, on Saturday, with the same predicted for Sunday and today. So, I brewed my cup of coffee, put the laundry in the washing machine, dusted the house, vacuumed, put the laundry in the dryer, stripped and changed the bed, cleaned bathrooms, hung up and/or put away clothes from the dryer, got everything done that I've been putting off for three weeks. The house is shining! Then I scrambled some eggs, made another cup of coffee, and sat down to catch up on my blog reading. I turned on my air conditioner yesterday, too. My condo isn't insulated, at least I don't think so, but the previous owners put in double paned windows and I have a neighboring wall on the north and south, so I stay warm in the winter without the heater and cool in the summer without my A/C. Most days. My plan for today is to catch up on my blog reading, maybe play some computer games, and do a bit of Kindle reading. I'll probably take Katie for a walk in the evening when it cools down. My house is clean, my shopping and laundry are done, and so I can just take it easy and rest up for work tomorrow. By the way, I've downloaded a free Kindle app on my new Droid2. I found out this morning there's a free Kindle app for the computer, too, either PC or MAC. I like the way the Kindle app looks. Amazon.com has lots of free books you can download, which is what I usually do. 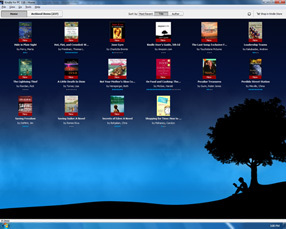 If you download one free book, usually other free ones will come up on your screen. Just double check before you download it to make sure it IS free. I just downloaded the app, and all 158 archived Kindle books from my account at Amazon.com are now on my computer to access whenever I want. Some I've read, some I haven't, but now they are all available to me on my Kindle, phone, or PC. I don't need to have my Kindle with me to read them. Pretty amazing! That new Kindle looks pretty nice, but I wonder how the sales will be now that they are offering free apps to use your phone and computer just like a Kindle. 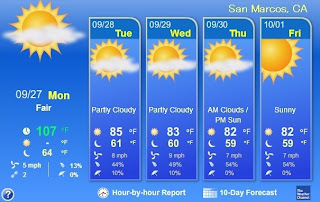 Before I finish, I just checked The Weather Channel for San Marcos, the (north San Diego county) city I live in, and it's 107 degrees right now, at 12:15. I haven't been outside yet, but it sure is nice having A/C!!! The little weather gadget at the bottom of my blog is for Encinitis, which is on the coast directly west from me about a 15 minute drive. The closest I could get to San Marcos for the gadget. It's where my son and his family live and since it's on the coast, it is a little different, but usually pretty close. I've noticed there are a couple of bloggers putting polls in their posts. I LOVE taking polls! Unless it's something I want to keep to myself, I always answer them. I thought I'd add the poll below to this post to see if you like polls. If so, I'll add some to my blog from time to time. I'll always have it set to show the results to the voters. You can't vote more than once, but your answer will be anomymous, only your vote will be recorded. There you have it. Voting will be open for two weeks, or until October 10 at 6:00 p.m.
By the way, my chicken soup is delicious! I'm saving some to bring to work for lunch in my "soup thermos." 1. Yes, potty trained dogs really do hate to have accidents. And I'm always afraid once she does, it will be easier the next time. 2. I do have potty pads, but forgot about them. Thanks, I'll put one out for Katie and keep it there, Just In Case. 3. Hulu - yes, I have that on my computer, too, as a Favorite, but for some reason I never use it. It does have more to choose from than ch131.com. I'll have to pull it up today and see which shows are there. I'd love to see Dr. Phil and Oprah's past shows, if anyone knows of a website that has them. 4. I had a question about where I work - that would allow me to bring Katie in. It's a small office, working for a general contractor who has businesses in northern and southern California. He is very entrepreneurial. We do not have customers coming into our office, and there are only three full time office staff here in San Diego (the corporate office) and the boss, who is gone a lot. The rest of the employees are in the field. He also owns a body/repair shop where he takes care of our fleet of trucks and works on custom cars which he buys in ragged condition and brings back to like-new appearance and working order, and then sells. I think that's his favorite business, his baby. He does a lot of the hands-on work there, orders all the parts, I think he still paints them, too, in the paint booth. He drives them for a while, then sells them. We owned a restaurant for a few years that was voted the Best in San Diego in it's class, that was just sold. I think he owns four businesses now, but I expect something new will appear when he's finished working on our new office/shop. We don't bring pets to work, but I have in the past when work was being done in my condo and I couldn't leave Katie there. Another employee occasionally brings in her daughter if she's in a bind. He's the kind of boss who doesn't care what we do all day, as long as the work gets done. We have an office manager, who watches TV all day while she works and takes care of all her personal business, the bookkeeper works from 8:00 to 2:30, with an hour lunch. Then there's me. I work four days a week from 7:00 to 3:30. I am his personal assistant and handle some personal business as well as whatever else he needs me to do for his businesses - marketing, correspondence, collections, advertising, research, etc. Sometimes I'm swamped, and sometimes I'm not, depending on what's going on. We all have different jobs and different hours, and we back each other up when needed. The IT guy, accountant, attorneys, and others are not on the payroll, but are called as-needed. It's a pretty sweet operation. My boss is very good at what he does and is a bit of a perfectionist. He's easy to work for as long as we do our jobs well. He provides full medical, dental, vision, and chiropractic benefits, vacations and holidays, an ongoing stash of treats for the office staff (whatever we want) and daily coffee, and the best work environment he can provide. He has almost no turnover in the office, as you can imagine. So, that's where I am four days a week, and will stay until I finish building my castle, and retire. I had to work today on my normal day off (a co-worker asked if she could take today off and switch with me and I agreed) and it was a looooong day with an hour and a half drive home. Then I found a big yellow puddle in the middle of my bedroom carpet, which is very light tan. It really shows the yellow. :( Not Katie's fault. I left at 7:45 a.m. and got home at 6:00 p.m., longer than her usual day being cooped up in the house. She went out in the morning at the usual time, and I'm home two hours later than usual. That's a long day for her, too. When I agreed to take this job almost 3 years ago, it was with the provision that I could set my own hours, and I chose 7 a.m. to 3:30 p.m. because of the terrible San Diego traffic. Those hours help my commute immensely. I pretty much get to drive the speed limit all the way to and from work. However... when I work in place of this other employee, I have to work her hours, and I get off at either 4:30 or 5:00, depending on the day. Driving home on a Friday, leaving at 4:30, increased my commute by one hour. And I took some detours and made u-turns to speed things up. I decided when I got home and saw the puddle, and took Katie outside and she still had to go more, that I'm not doing this anymore. From now on, I'm taking Katie to work with me if I have to work anyone else's days or hours. Otherwise, it just doesn't work for me. Or for Katie. I'm sure it will be okay with my boss, but I just hate to ask for favors, you know? But since I'm doing a favor, I'm going to ask for one in return. I'll let you know how that works out next time. Other than the above, this is going to be a short post. Because, I'm tired (see above) and going to climb into bed and watch TV until I fall asleep. I wanted to tell you, in case you don't already know, about www.ch131.com. Now that the new shows are out and THANK GOODNESS there's something to watch on TV again, especially for us frugal folk that only have Basic Cable, I'm really enjoying my old shows and some new shows. Unfortunately, sometimes I'm too tired to stay up to watch them, or there are two on at the same time. I know, I know. Can you say TiVo? Or DVR? But, being one of the frugal folk, I don't want to pay for them. I did call my cable company yesterday to ask about the DVR, and it costs almost $20 per month. Just to tape shows???? I have a DVD Player/Video Cassette Recorder. I have cassette tapes. Then I thought, TiVo? What would that cost? I did some Internet searches, but couldn't quickly find the cost of TiVo, but the TiVo machine looked pretty expensive. So, those two are out. But ch131.com is in! If you haven't heard of ch131.com, it's an Internet site where someone in the mid-west or on the east coast films TV shows without the commercials, and puts them up on this site. So, I can watch them an hour sooner than they are showing here on the west coast, which gets me to bed an hour earlier, and also, I can watch them any time after they are up on the site, so if I want to catch up a week later, I can. 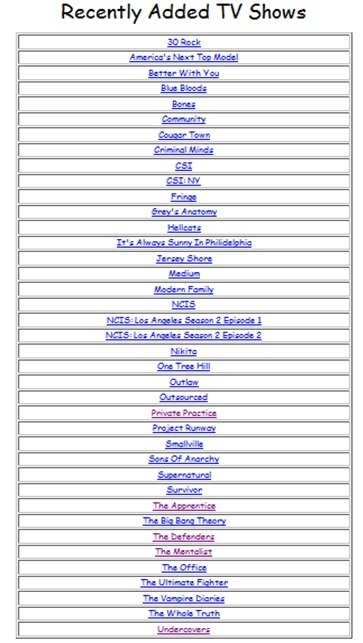 If you click on this, you can read the TV shows listed so far this week. 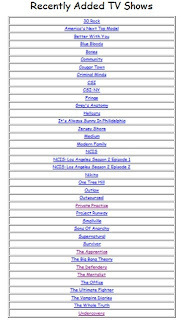 I just caught up on the shows I've missed this week (the ones in the purple color). I don't think it's as good as a DVR or TiVo, but maybe it is. I don't have to set anything, just go to the site and pick what I want. Of course it doesn't have everything that's on TV, but enough for me. By the way, when you click on a show you want to watch, a screen comes up with a box in the middle with an ad on it. Wait for a minute, and another box will appear at the bottom that says: "Close to Play." THAT'S WHAT YOU CLICK ON TO SEE THE SHOW. So, that's my tip for the day. I just let Katie out for her final final, and when I stood up I could smell the most wonderful smell. I said to myself, "Boy, someone is cooking something good!" That's when I remembered the chicken I put in the big pot of water when I got home from work. Thank God I put it on LOW! The remains of a roasted chicken I got at Costco - they are so good. To make soup tonight that I can eat over the weekend. I have all the veggies and chicken pieces all cut up on a plate next to the soup pot, ready to throw in once I drain the broth out. Well. I sure do have some potent soup broth. To throw the other ingredients into. Tomorrow. WELCOME to my new followers John and Bridget, Travels of John and Bridget. I'm so happy you've joined me and my dog, Katie, on our journey. We're glad you're along for the fun. This was lots of years ago, and I must have been going through a period in my life where I was disappointed in people, and my plans and relationships with other people weren't working out, and I guess I decided I was going to "build my own castles," and not rely on anyone else. I made personal stationary with a small graphic, used the image as a logo on a personal "business" card, and made an iron-on sheet to press it on a t-shirt. I always put "Build Your Own Castles" under the graphic. And I meant it both simply and aggressively, I think. 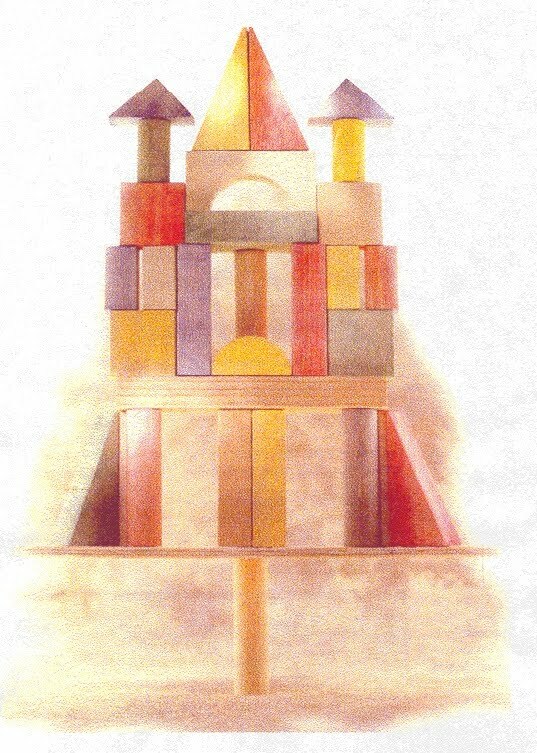 This graphic became my own private, personal Statement, with a capital S.
I remember this box of blocks, maybe my kids had them when they were young. They fit perfectly into a wooden box when the blocks were arranged correctly. I don't think it's a memory about the actual box of blocks that draws me, but there is something that speaks to me when I look at the graphic. All my life I've had dreams about houses. Really good dreams, about a house that I suddenly find out is mine, and when I go into it and walk around, I find secret rooms or closets filled with treasures of various kinds, and they are all mine, too. Each dream has had a different kind of house, and each house has a different kind of treasure. I specifically remember the first "house" dream I had when I was a child. That's when I realized I dream in color. I can still see the dream as I'm moving through the house, all the bright colors. Many others followed throughout the years. Always good dreams and I'd wake up feeling happier than usual. Somehow my "house dreams" and this graphic go together. I get the same good feeling when I see this block castle, and think about building my own castles, or in other words, fulfilling my own dreams. Not needing anyone to help me build my own future. Not having to help someone else realize their dream, and ignoring my own. I think that's what I'm doing with my plan to retire, dispose of my condo and all my "stuff," buy a small RV, and live on the road. This will be my "dream house," and think of all the "secret rooms" I'm going to find with all the treasures. Each campsite, each RV park, each city and state, everywhere I travel will have new secret rooms with new treasures for me to find. Building my OWN castles, on my own terms, for myself. I might even put the graphic and title on my little RV when I get it. Wouldn't that be great? I think living out my dream of residing in a small RV will be wonderful, and hopefully put me in a place I really want to be. Emotionally, spiritually, and physically. And if not, I'll move to another place. So, congratulations to all of you out there who are building your own castles. And for the rest of us, let's start Building Our Own Castles! As I said in my September 13 posting, my daughter, son-in-law and grandkids took me to Six Flags Discovery Kingdom. 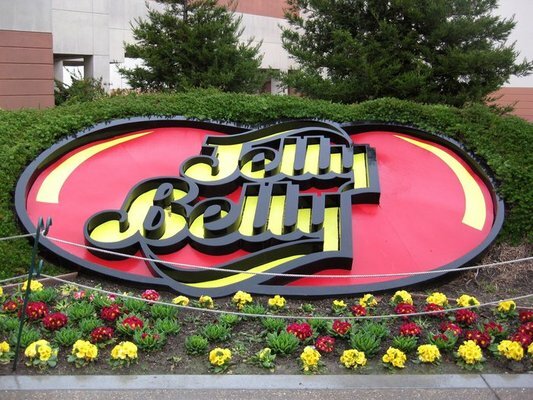 I had never been there before (they have season tickets and go often), and as we walked around, I couldn't believe all the rides and exhibits and animals--that's where the butterfly conservatory was, too. 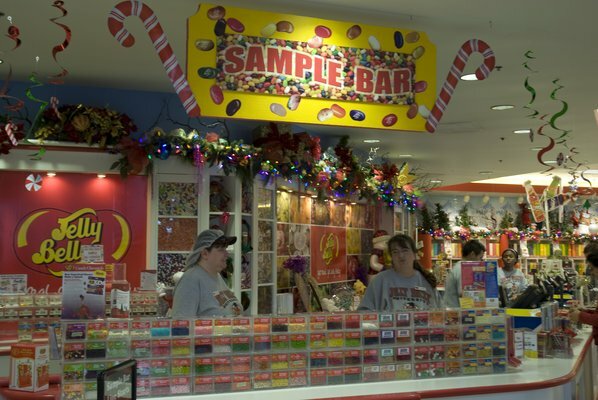 They have over 30 animal attractions, over 100 different species, and over 500 animals. We saw giraffes, dolphins, alligators, sharks, stingrays, elephants, tigers, and butterflies, and many, many more. It's definitely a full day. 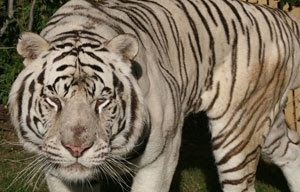 According to their website, "Six Flags Discovery Kingdom has been the home of tigers since 1968, advocating conservation and awareness of these magnificent animals and educating the public about these critically endangered cats. The park is home to 11 Bengal and Amur tigers." They are very large, very beautiful, and very graceful. To see a cat that large walking, running, and swimming was amazing. They explained that they don't train the tigers to do "tricks," they train them to perform natural activities that they would perform in the wild, they just do the activities on cue for the trainers. Again, per their website, "Odin's temple of the Tiger is an exhibit, stage venue and showcase for Odin, the park's famous white Bengal tiger, renowned for his agility underwater. The show also features Fedor, Nalin, and Akasha in this untimate demonstration show." We attended this show, and it WAS amazing. Here is a YouTube video of the underwater part of the show. The trainers throw hunks of meat into the water, and the tigers dive for them. There were all kinds of animals to see - unfortunately I didn't get photos of many, but you've seen them all before. I did snap a picture of some camels. Can't remember the last time I saw a camel. There were lots of rides, too. We stayed in the area for younger kids, and went on a lot of rides. Here's Andrew, Lauren and Daddy, Matt in a car that goes on a track around the grassy area in the middle. See the little building in the back? It's a turtle house. If you click on the photo, you'll see a large turtle (tortoise?) in front of it - looks like a large rock. They have, I think, three turtle houses, and we saw two or three large turtles. Today is my youngest granddaughter's birthday - Lauren is Three! When I was visiting in Vacaville, Lauren told me when she is three, she will be a big girl. So as of today, Lauren is a big girl. They are going to Chucky Cheese Pizza for her party this evening. Lauren and her brother, Andrew, are probably already home and in bed. I hope they had a good time. Lauren visiting Grammy (me) a few days before her 2nd Birthday. We made a little cake together, and Lauren decorated it all by herself. When I called this morning, Kristy and Lauren were making cupcakes to take to Chucky Cheese for the party. They were waiting to pick brother Andrew up at kindergarden so they could all decorate them together. I asked Lauren to have Mommy send me pictures of the finished cupcakes. Lauren just LOVES Katie. When we'd leave Katie home to go somewhere, out of the blue Lauren would say, "I wonder what Katie's doing now." I'd say, I'll bet she's sleeping. Lauren would say, "I think she's waiting for us to come home." And of course, when we'd get home, Katie would be waiting right by the door, so Lauren probably thinks she's been standing there waiting for us to get home since we left. Her mom and dad told me she talks about Katie a lot. This photo was labeled "Lauren's first slumber party" on her mom's face book page, so cute! She sleeps with her babies and animals every night in her little bed. Not always this many, though. WELCOME, Susan S! 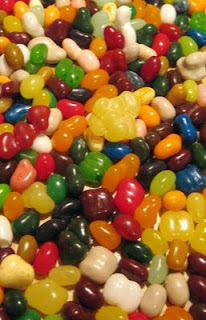 Thank you for following my blog, I enjoyed reading yours, and hope you enjoy following along with me and Katie! This is something I've been thinking about: How easy is it to sleep in when staying at an RVpark? Then Margie, (My Healthy Living Thru Weight Control), mentioned in her blog today that she and her husband, Bruce, set the alarm for 6:30 a.m. every day. They are full-timers. I work four days a week, and always set my alarm for those work mornings to make sure I am up on time. Just In Case. Since I've been doing this for so long now, I usually wake up before the alarm goes off. But on the other three days, unless I have to be somewhere early, I NEVER set it. I still usually wake up early, unless I'm really tired. I was always a sleeper when I was young, I always hit the snooze button over and over, and got up at the last minute. As a teenager I slept in as long as I could on weekends, 10 or 11:00 a.m. Drove my mother crazy! My grandmother was an early riser, one of those people who wake up and get up really early, like 5:00 a.m. - every day. No alarm. I always wished I could do that and now I can, kind of. My plan when I am a full-timer is to get up when I wake up without having to set an alarm. I don't expect to be much of a sight-seer, I just want to park and live in different areas of different states. I've wondered, though, how easy it is to sleep in when one is parked in an RV park. The rigs seem to be very close together, and unless I'm boondocking or staying in a relatively empty park, wouldn't the normal noise of people getting up, going out, moving around, starting cars, etc. wake me up, and everyone trying to sleep in? Might seem silly, but this is something I've been wondering about. "I set the alarm clock for one minute past midnight so it was April 1st. The alarm went off, my husband got up, shaved, showered and then came back to the bedroom to get dressed, checked the clock and, well, he didn’t talk to me for two weeks." LOL! 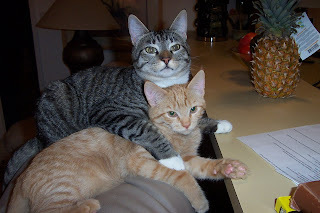 Even though I am a dog person, I have had cats in the past. 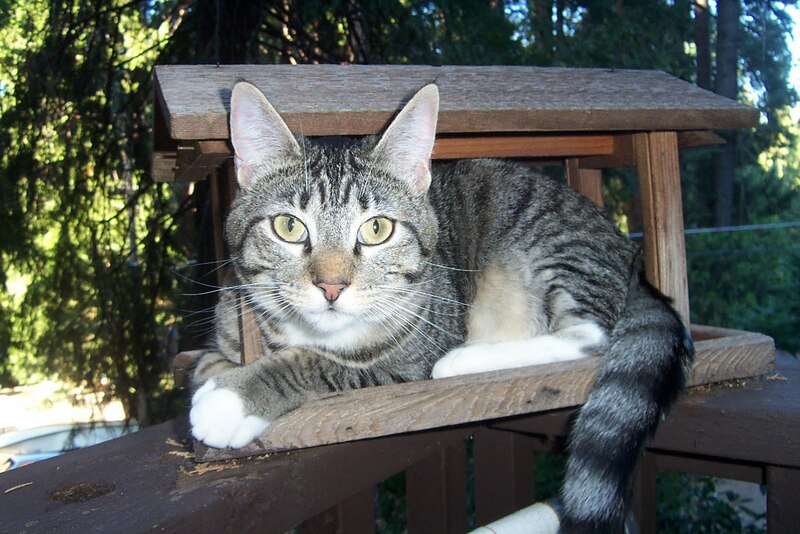 When I lived in Pollock Pines, CA, I had two cats, Baxter, a grey tabby, and Brady, an orange tabby. They were the best cats, and I really miss them. These are two photos I have of them, and I thought you might enjoy seeing them. Baxter and Brady sitting on the back of the couch. Judy, what kind of bird is this? Baxter's favorite place on the deck. This bird feeder didn't attract many birds! Last night got pretty cool, and when I was sitting on the couch watching TV and playing with my laptop, Katie was sitting next to me shivering. She doesn't shiver like a lot of small dogs, only when she is cold. So I dug out one of her sweaters, she was so excited she ran and ran all over the house. Here she is - in a beautiful blue sweater with black polka-dot collar - what all the fashionable dogs are wearing. : ) And the shivering stopped. My son, Tom, and his wife, Trish, are out of town for a few days and they needed help with the kids (my grandkids). So, Friday I picked them up at school and dropped them off at home, where they have someone helping them with the kids. I had wanted to spend some time with them while Mom and Dad were gone, but I've had a bug since I returned from Vacaville. (I usually do come down with something when I get home from Vacaville, I think it's the change of weather.) It's not too bad, but I didn't want to pass it on, just in case. 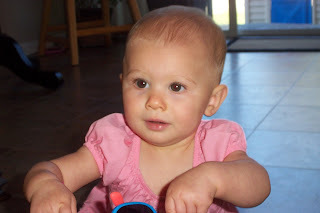 So, today at noon I picked up my grandaughter, Kennedy, brought her to my house for lunch and some playtime. I always have my son's kids, who live nearby, come over for their birthdays and we bake a birthday cake for them, they get to help as much as they can for their age, and then they get to decorate it, and bring it home. So, today when Kennedy got here, the first thing she wanted to do was bake a cake. Not a birthday cake, an unbirthday cake. 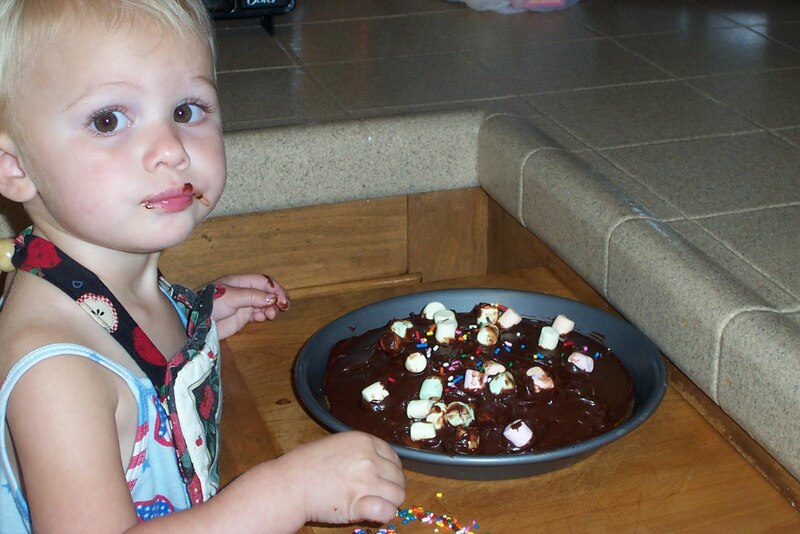 I never bake anymore, unless the kids are here, but luckily I had a cake mix in the cupboard. As Kennedy was putting it together and mixing it up, I realized I didn't have any "store bought" frosting, which I usually have on hand. Out came the "encyclopedia cookbooks," remember them? Sure enough, a ton of frosting recipes, including a simple white powdered sugar/butter frosting, just what I was looking for. And boy, was it good! Notice the Jelly Belly hat - I didn't realize I brought it home in the bag with the Belly Flops, and Kennedy happily wore it while baking. Here is the picture so far...we had to leave for "cheerleading class," so we left everything out so she can finish it next time. She used lots of 3-D elements that were pretty cute - a bell over the roof of the house, a wooden sign on a post that says "Home Sweet Home," a ladybug on the flower. Of course, palm trees for a San Diego house. After cheer class, we picked up Kennedy's brother, Gavin, who is 5. He was at his Little League game when I picked up Kennedy, and then he stayed to watch his friend's game, too. The friend's parents brought him home, and we picked him up and went to McDonalds for dinner. They also have a little brother, Graydin, who was two in April. He's my youngest grandson, and stayed home today with the Nanny, while the other two were out and about. I have five grandchildren - two are my daughter's kids, in Vacaville, and three are my son's here in San Diego. They are such cute kids, enthusiastic, smart, polite, and so much fun. There are all the best! But they do wear me out - so I am now going to get little Katie and we're going to bed. Looks like she's ready! Good Grief! I forgot to WELCOME my two new followers yesterday. Too excited about my new phone. So... a belated WELCOME to Heidi and Freely Living Life! Thanks for following Me and My Dog, and I hope you enjoy the ride! We're happy to have you along. Still working on setting up my new Droid2. I went in this morning to the Verizon store. They said on the phone it was a class from 8 to 9 am., so I was there at 7:50 - of course, early! They opened the doors at 8:00, and their were a few of us. It's not actually a class, just a tutorial of whatever questions you have. They had 4 or 5 sales people there to help, so it went pretty fast for all of us. I bought the screen cover - a thin plastic sheet that goes over the screen so it won't get scratched - and a cover for the phone. I was going to get the leather cover, but a man next to me recommended the rubber, or silicon, cover, which he said was easier to hold onto, so that's what I got. I've got all my contacts in now, with photos by their phone numbers so when people call me, their photo comes up and I can see right away who it is. At least for my family and friends. I always go around the house and take photos of photos with my phone. Then I transfer them to the contacts. I downloaded Picasa again, I haven't had it on this laptop, and it did it's thing finding all the individual faces and putting them together in separate files. Love the way it does that face recognition. I'm wanting to put together a video of my granddaughter, Lauren's, first gymnastics class - she was so cute and loved it so much, I pretty much videotaped the whole 45 minutes. There's a lot that needs to be cut out, so I need to find a program to do that. I've never worked with video before, so between the new phone, playing with Picasa, and learning how to cut the video into a movie, I've got my work cut out for me. 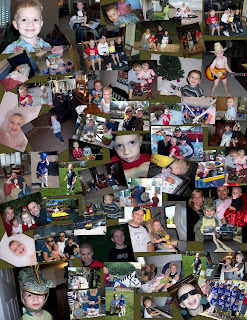 I spent a good part of this morning adding names to the photos Picasa didn't recognize. 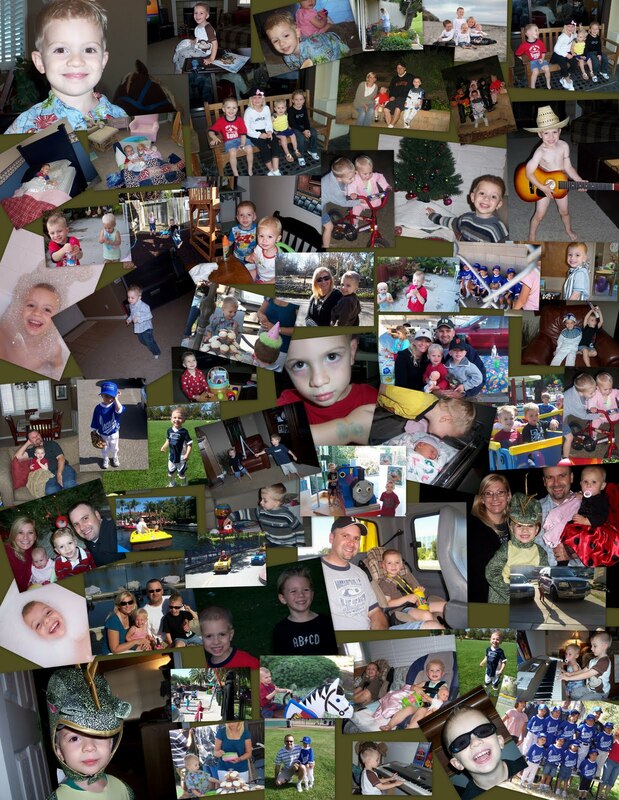 Then I made a collage of some photos of Andrew, my grandson. They are such cute kids, smart, athletic, good looking, sweet, well behaved, and they love Grammy and Katie. What more could I ask? I had the best intentions of posting some info and pictures I took last week, but then my new Droid2 arrived! Taaa Daaa! 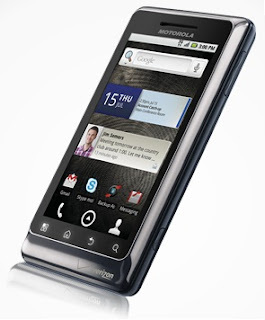 I haven't bought a new phone for three years, so all the features in this phone were really foreign to me. When I was at my daughter, Kristy's, house last week, she had a new iPhone and it looked pretty neat. She was following people on Facebook, getting and sending e-mails, checking websites, lots of different things. I've been thinking about getting a new phone for a while now, and that tipped the scale for me. 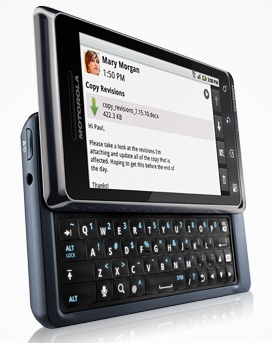 When I got home I did some searches on the phones available, and decided on the Droid2. My daughter-in-law, Trish, has the Droid X, which is the one Leo Laporte, the Tech Guy on the radio recommends, but I was thinking I might do better with a real keyboard and the Droid2 has a slide-out keyboard. So, it arrived this afternoon, and I've been playing with it since - pretty much non-stop for over five hours! At first I couldn't even figure out how to get the normal Home Page - it had something weird on the page that I couldn't get rid of. And it kept "going to sleep" every 30 seconds while I was trying to figure out things, very frustrating! : ( I called Verizon, and the woman couldn't figure out what was going on, either, put me on hold, and I lost the call. That was probably when my old phone was disconnected. The phone didn't come with an Owner's Manual, so I went on-line and downloaded it. I'm going to have some fun with this! For the last 5 hours I've been setting it up, downloading apps, syncing it, etc. It's kind of like reading the blogs I'm following: I see something, click on it, start reading, accidentally hit the screen wrong, then I'm in another area, so I start reading about that, or checking it out, looks good, download that one, etc. Little by little, I figured out some things, and I think I like it. I called the local Verizon store this afternoon to see if someone there could take some time with me if I came down, and he said every Saturday morning from 8:00 to 9:00 they have Droid2 classes. So, think of me tomorrow at 8:00 a.m. (if you're awake) when I should be sleeping in - down at the Verizon store learning what I need to know to operate my phone. What a world we live in! I also got the Multimedia Station to charge it. 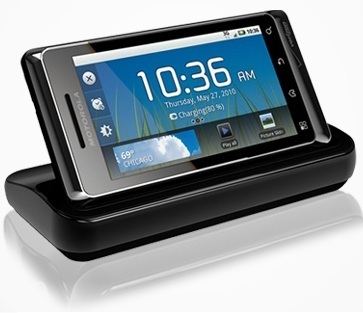 I can create a wi-fi hotspot with up to five connections with this phone, so, from what I'm reading in some other blogs, it might be helpful on the road? I'm with Verizon, and until today I was on a month-to-month basis since my 2-year contract was up last year, but I'm sure I'll stay with Verizon, so signing up for another 2 years won't change anything for me, except to get a $150 discount on the phone. This is the first time I've actually paid anything for a phone, I hope it's worth it! I have so many blogs to catch up on. I didn't do much reading while visiting with my daughter and her family, so tonight I'm catching up and enjoying hearing about all your adventures while I was gone. 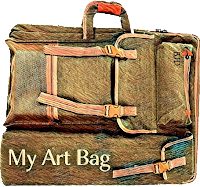 I'm also following the links to some of the blogs you are following. Once I start doing that, I'm gone... Suddenly it's two hours later, and I'm following new people in all phases of their RV lifestyles. It's fun to add new followers to my list. Seeing that you follow their blogs is a good recommendation for me that I'll probably enjoy their journeys, too. So, thanks! I love the way Blogger allows me to list the people I follow, and puts them in order so the most recent blog updates are at the top of the list. Before I started my own blog, I had the list of blogs I followed in an Excel spreadsheet, and every day I copied and pasted every URL into my browser, in order, so I wouldn't miss any. Of course not everyone posts every day, so lots of my copy/pastes had nothing new, and it was really time consuming. This is a MUCH better way, and I can zip through all the recent posts until I get to ones I've previously read. We left at 4:30 a.m. on Friday morning, and Katie and I drove to Vacaville to visit my daughter, Kristy and her family. She has a great husband, Matt, and two darling kids, Lauren who is 3 this month, and Andrew, who is 5. We were sooooo busy while I was there. I took some photos and will post them this week with brief discriptions of where we were. 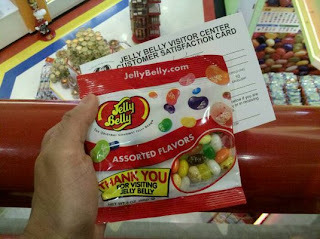 One day we went to the Jelly Belly Factory - just me and Kristy and the kids. Following are photos of Kristy and the kids - none of me, thank goodness - wearing the official tour hat. We were waiting in the outer room for the tour to begin. If you don't wear the hat, you don't take the tour. It's a requirement. Lauren put on her own hat. Kristy later told me my hat was upside down, too. Like Grammy, like Granddaughter. You can see by the expressions on their faces that the waiting room wasn't too exciting. It was a neat tour, very interesting, and I'd recommend anyone in the area taking the time to tour the factory. 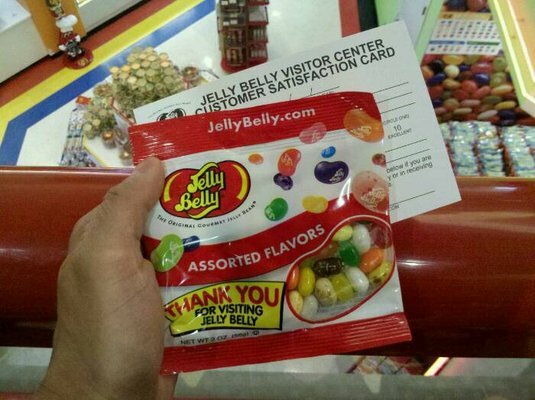 You get samples as you go along the tour, and a little bag free at the end. We were in Fairfield, CA but they also have tours in a factory in Wisconsin. You won't get Jelly Bellys any fresher than this! WELCOME to my new Follower, Dave. Thanks for signing on - I hope you enjoy my journey to fulltiming! I'm back home again. I thought I'd be too tired to put a blog together today after driving eight hours, so I have another JibJab for you - my grandkids love these little videos! I'll tell you about my trip during this week, and show you some pictures I took. From Me and My Dog, Winner of the Gold, have a good evening, everyone! Today my daughter, son-in-law and grandkids took me to Six Flags Discovery Kingdom in Vallejo, CA. I couldn't believe all the rides and exhibits and animals there. I've never been in a butterfly conservatory before. When you walk in, it's warm and humid, junglelike, full of flowering plants, bushes and trees. Then you notice butterflies every where. Small, medium and large butterflies of all colors, drifting down toward you, lighting on a leaf, chasing each other. It was like being in a fairytale. Unless they were sitting on a leaf, they were moving too fast for my camera to get a good photo. I have a new Canon, and it's not the fault of the camera. I'm just learning how to use it, and today I had a lot of practice before the battery started going out. Want to see my new office?